10:00 – In the morning in the hotel lobby you will meet a guide and you will go on a tour of the historical complex of Japan – Kamakura city! Within an hour’s drive south of Tokyo, it is a small quiet town, surrounded by the sea and a ring of hills covered with forests. In the early 12th century, Kamakura was the capital of Japan. 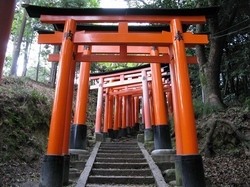 Many of its 65 Buddhist temples and Shinto shrines dated 19 8-12 centuries. 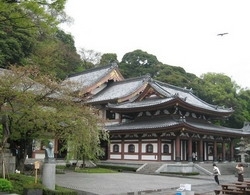 Built in honor of the goddess Kannon Temple Hase-dera (admission 300 yen Jap). Legend attributes the foundation of this temple to the 8th century. According to her 711 a priest named Tokuda, who served in the temple of Hase-dera in Nara, ordered two sculptors cut from a single piece of camphor wood, sawn near the temple, two 11-head statues of Kannon. When the work was finished, Tokuda one statue placed in the church, and another thrown into the sea with a prayer that the Cannon blessed the place where the statue will be brought waves. Fifteen years later a statue found on the Miura Peninsula, not far from Kamakura, the court aristocracy, belonged to the imperial clan Fujiwara Fusasaki. According to legend, he moved the statue to the place where there is still kamakursky Temple Hase-dera . In the temple you will visit the temple – cave . It is a place dedicated to the goddess Benzateyn. The stone walls of the caves carved figure of the goddess and her 16 children. It is worth noting that Benzayten sea goddess and the only woman among the famous seven gods of good luck in Japan. She is also the patroness of music and arts. Moving from temple to temple you will appreciate the beauty of Kamakura, because in its narrow streets with neat houses and peeping from behind fences gardens is much more pleasant to navigate on foot, enjoying the sun, the colors and funny squirrels. The next temple that you visit called Kotokuin. 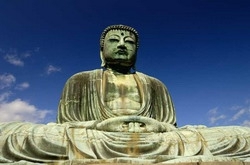 Its territory is famous b ronzovaya statue Daibutsu – Great Buddha – the second largest in Japan (jap ticket 220 yen) . Its height – 13.5 m, weight – 93 tons. 13:00 – Lunch at one of the local restaurants where you can taste all the sophistication of local cuisine and traditional sweets Matcha and Wagashi! The guide will help you with a choice of dishes. 14:00 – . 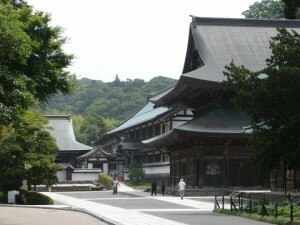 Continuation of the tour you will visit the temple Hatimangu – a sanctuary dedicated to the god of war, as well as the memory of the legendary Emperor Ōjin. Since this temple is connected belief that if in the surrounding park you can walk along the slippery humpbacked bridge across the lotus pond without assistance, you are expected to live long. 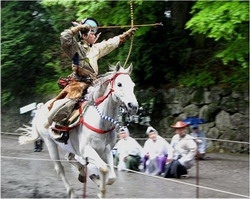 In the Temple Tsurugaoka Hatimangu held the most populous and lush Kamakura Festival.Twice a year – in autumn and in spring there are organized competitions of horse archers and costumed processions. Walk among the town of Kamakura temples will be the most pleasant memories of the tour in Japan, you are completely immersed in the atmosphere of the 12th century, you will feel a part of a great past. The tour price includes : Russian-speaking guide 8:00, lunch and city transport. * Entrance fees to museums paid by customers for cash on the spot. The tour price includes : Russian-speaking guide 8 o’clock, dinner, customized car.